Moving is never an easy thing for me to do, I don’t particularly like change or the stress moving always puts on me. This was a particularly stressful time as I was 8 months pregnant. Despite the fact that we gave the moving team the wrong directions, they beat us to the house by 30 minutes and did such a fantastic job. You and your team made a stressful situation so much better. I can’t image going with any other movers! Do you need to know the weight of your commercial truck, personal vehicle, or freight? 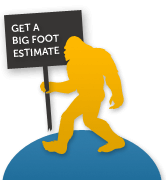 If you are in the Boston area, Big Foot Moving & Storage, Inc. has you covered with accurate, reliable, and certified weight. Big Foot Moving & Storage, Inc. is your closest public truck scale in Boston that offers certified weight tickets obtained on a licensed truck scale. Expect “quick and painless” from the moment you pull on to the scale, to the moment you pull off. Why drive out of the way to find a CAT certified scale, when our public truck scale in Boston, Massachusetts offers competitive pricing, quick-on and quick-off service, and a friendly expert staff who values your time and business? We are conveniently located near Interstate 495, Route 2, and Interstate 95/128. The truck scale is open to the public from 8:00 AM -5:30 PM, Monday through Friday and on Saturday from 9:00 AM – 12:00 Noon. 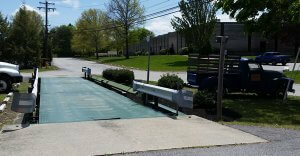 We are located on a 4 acre lot, so there is plenty of room to maneuver. Our truck scale can accommodate loads of up to 120 tons and is mounted with the weighing equipment and platform in a pit so that the weighing surface is level with the road. Check your gross vehicle weight to determine whether the vehicle is safe to travel on the public highway without being stopped and fined by the authorities for being overloaded. To learn more about our certified truck scale, contact us today at 781-488-3090 or email us at info@bigfootmoving.com.